I hope everybody's having fun working on the project. I'm really glad to be a part of the team. I'd love to get to know everyone here. So I'm curious - do any of you have a particular character/avatar/OC/Ponysona or whatever you want to call them that you tend to use here in the community to represent yourself? I'd love to hear about them! Anyways... below is my character (generally speaking). I started doing a comic surrounding him recently that can be found over on my DeviantArt page. Fallout 4 and FoE inspired me to create a version of the character as he might exist in the FoE timeline. Cutie Mark: Navy blue six-pronged gear spinning counter-clockwise in an eight-pointed arc of turquoise energy. Special Talent: Analysis and Duplication. Nova has the ability to analyze and recreate spells or mechanical items.This makes him particularly useful in studying, reconstructing or reverse engineering items for future manufacture. 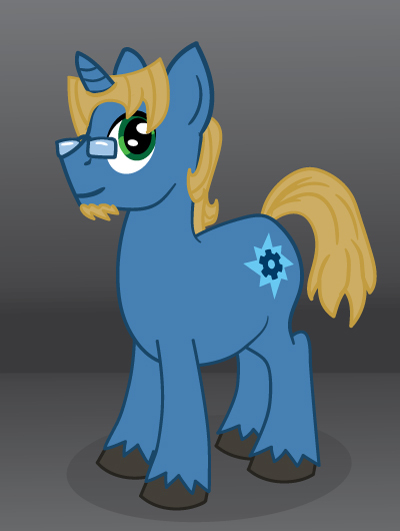 The first Unicorn in his family in three generations, Nova was born in the small Earth Pony town of Gallop, south of Las Pegasus. 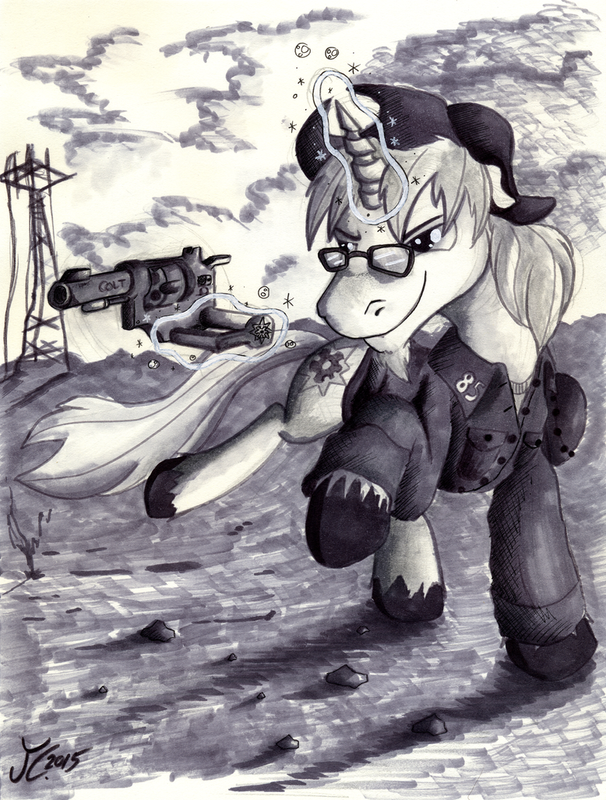 Raised in his father's mechanics shop, Nova eventually entered magical studies at the Manehattan Institute of Technomancy (MIT), an institution that specializes in all forms of hybridized magic and technology, ranging in scope beyind that of the pure magical theory Canterlot School for Gifted Unicorns (CSGU). At the Institute Nova's focus is Technomantic Analysis of ancient artefacts in an attempt to recreate lost spells. A recent discovered caché of artefacts have revealed a strange mirror and several tomes that are rumored to have possibly belonged to Star Swirl himself. 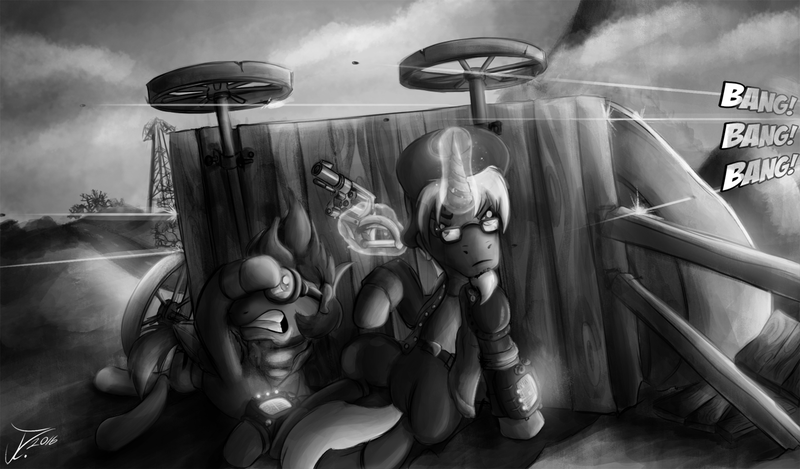 Following growing tensions with neighboring nations, several researchers at various institutions throughout Equestria were conscripted by the newly formed Ministry of Arcane Sciences and their work reassigned to better serve the needs of the nation. Nova was transferred from portal research to the spell application division of Twilight's (internally nicknamed) "Alicorn" project. The focus of Nova's work was the regenerative and restorative spells and their applications in practical technologies. Nova's team led to the creation of an experimental series of stasis modules used to preserve life in the event of a megaspell attack. A preliminary series of less than a hundred pods were constructed under contract by StableTec at the jointly managed MAS Beta Site laboratory. Beta Site management convinced Nova that in order to instill confidence in the technology's safety, team members should volunteer for test stasis procedures. Nova was among the first to test out the pods. The facility he awoke in, however, was not the facility he remembered. Instead of awakening days after the initial test at the Beta Site as planned, he found himself alone in StableTec Deep Storage Facility 85. Buried in the side of a mountain several hundred kilometers away from Manehattan, the facility had been left abandoned for nearly two centuries. Nova's pod was one of only a few that had been relocated to the facility. The remaining pods were empty. Now, displaced in time, Nova wanders the wasteland in search of rumors of other survivors from his age. *Note: Four-Eyes trait taken from Fallout: New Vegas. Lucky Eyeglasses are a clear variant of Lucky Shades from NV. Blue Nova. Art by Droakir (me) on DeviantArt. FoE Nova Portrait. Art by Droakir (me) on DeviantArt. Nova, Wasteland Wanderer. Art by James Corck on DeviantArt. [DETECTED]. Art by Billy Rumschik on DeviantArt. Wasteland Shoot-Out, ft. Free Fall and Blue Nova. Art by James Corck on DeviantArt. wow, there is a lot of detail here! i just recently started trying to piece together the details behind my OC that i finally got someone to draw for me. below are currently the only two images i have, im waiting on a commission so i'll have a 3rd more detail specific drawing. unlike most here on this forum i am not a creative type, its very hard for me to create something from nothing. though i am kinda good at manipulating/molding things that already exist to my liking. anyway the little i do know for certain is that he is a zebra which looks like the images above. he earned his cutie mark from story telling. telling tails of history long past, premonitions of whats to come, or simply crazy tails to entertain the young ones. Heya Sonic Radboom! That's awesome! And it's perfectly all right if it takes you a while to come up with character concepts and the like... not everyone is the creative type, nor should they have to be. Regardless, I really like the character design. You've already got the design pretty much down it seems, and you already know what his talents are, which is a good basis for backstory. From what I've seen as far as names are concerned (we've only really seen one zebra main character in Gen 4 show canon. But in other generations we had Zeb and ZigZag) a lot of the zebra names start with 'z' or 'ze'. 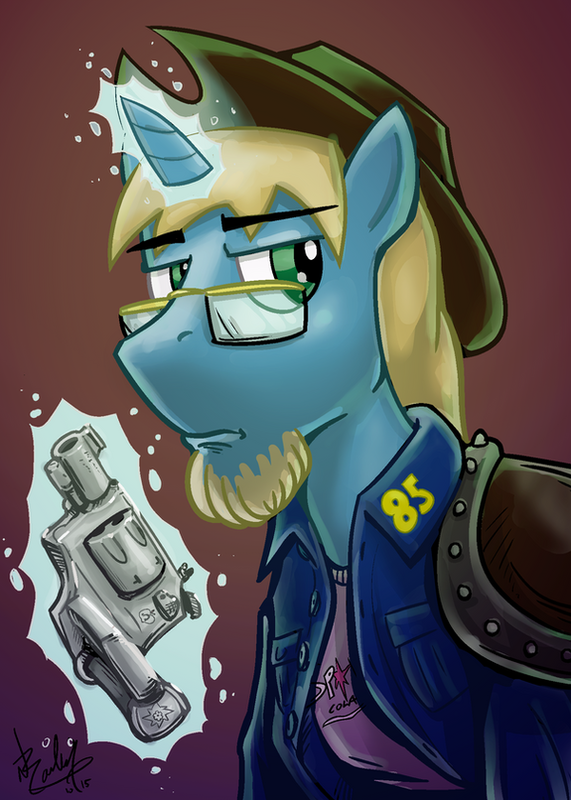 In Fallout: Equestria we had characters like Xenith. It started with an Xe, but it still makes the Z sound. This is similar to the naming scheme that we see where most (not all) griffons in the show have names that start with a G (Gustave, Gilda, Grandpa Gruff, etc.). Xavier - Latin - "The New House"
Xerxes - Persian - "King/Ruler"
Xander - Greek - "Defender of the People"
Xenos - Greek - "Guest/Host"
Xylon - Greek - "From the Forest"
Zareb - African - "Guardian"
Zalman - Hebrew - "Peaceful"
Zaccur - Hebrew - "Mindful"
Zamir - Hebrew - "Song Bird"
Zaire - African - "River"
Zahur - Arabig - "Eminent"
Zephyr - Greek - "West Wind"
If you wanted a name related to the cutie mark/talent, as is the case often, I would say Xenos, Zareb, Zaccur, Zamir, or Zeta would be good names as they could be related to stories, songs, traditions, or guarding said things for preservation for future generations. Anyways, I look forward to hearing more about your character! (01-23-2016, 01:57 AM)Blue Nova Wrote: From what I've seen as far as names are concerned (we've only really seen one zebra main character in Gen 4 show canon. But in other generations we had Zeb and ZigZag) a lot of the zebra names start with 'z' or 'ze'. In Fallout: Equestria we had characters like Xenith. It started with an Xe, but it still makes the Z sound. exactly, this in particular is why i was having such a hard time with the name. of all the names provided those 2 names are the top candidates. though i think Zamir (Zah-Meer) sounds the best and has a nice meaning. i also couldn't help but laugh when i read Xerxes as all i could think of was the movie 300. Thanks a lot for the help in naming my OC, i was really stuck there. (01-23-2016, 09:29 AM)Sonic Radboom Wrote: of all the names provided those 2 names are the top candidates. though i think Zamir (Zah-Meer) sounds the best and has a nice meaning. i also couldn't help but laugh when i read Xerxes as all i could think of was the movie 300. Thanks a lot for the help in naming my OC, i was really stuck there. Zamir sounds like a really great name for a zebra character! I like it! And not a problem. Whenever I have difficulty naming characters, I usually fall back on this type of formula (figuring out if there are any patterns to how types of characters are typically named, and using that to narrow down the choices). It seems to work pretty well. i got my latest commission last night and now i think i have a perfect base vector of my OC. Hey! Zamir's looking great! I love how he turned out! He was a special correspondant for the Equestria Games that took place in the Crystal Empire, and had articles he wrote for that in Equestria Sports Monthly and papers around the nation. He is extremely interested in learning new things and writing about them. His pride and joy is a historical fiction he's working on taking place during the time of the Great War before Hearth's Warming. He calls it Before Equestria, and releases it episodically. It covers many key players, including Star Swirl the Bearded, King Golden Mark, Firebreath, Colonel Noble, etc. Update: i just got my first reference sheet made. i really think i am getting really close to exactly how i want him to look. now i just need to flush out some context and FOE variant. i honestly think that a "Zebra Story Teller" wouldn't exist in the FOE realm until after Little Pip changed everything. that said he must have been either really young or born after the Sun was restored the land of Equestria. (05-06-2016, 04:45 PM)Sonic Radboom Wrote: Update: i just got my first reference sheet made. i really think i am getting really close to exactly how i want him to look. now i just need to flush out some context and FOE variant. i honestly think that a "Zebra Story Teller" wouldn't exist in the FOE realm until after Little Pip changed everything. that said he must have been either really young or born after the Sun was restored the land of Equestria. Wowsers! That is some fantastic artwork there, from the glyph to just about everything. Show-quality stuff. Who did it?